Metal, a genre that has become so steeped in its own clichs of senseless negativity and worn-thin musical conventions, has slowly become more and more irrelevant and maximized less and less as art. The movement that started as a reaction to commercial, formulaic hair bands has evolved into little more than a way to sell soda and second-rate nihilistic worldviews. Enter Demon Hunter. Identified immediately by their epic name, which upon listening, starts to take shape as something reflective of inner turmoil, the dissonance of the human condition, and the existential plight (as opposed to the sloppy and literal translation imposed by many), Demon Hunter crafts anthems of passion, brokenness, and separation in a poetic language independent of current faux-angst vernacular. Their loyalty to credible metal acts such as Sepultra and Machine Head, and an extraction of the redeemable qualities of nu metal, such as verse/chorus song structure, form a hybrid of traditional metal brutality and haunting melodic beauty. Fans of current acts like Deftones, Slipknot, and Linkin Park will immediately identify with the crushing back-beats; passionate, terrifying vocal delivery of melody and screams; and traditional metal riffage. 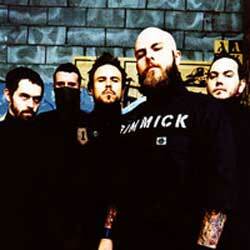 However, songs like "My Throat is an Open Grave" make obvious the distinction between conventional teen-metal acts and the tone and execution found in Demon Hunter's debut. Featuring unexpected cello, programming, and an undeniable sincerity, this first single, exploring the perpetual frustration of spiritual and personal inadequacy, is a glimmer of hope for an age of contrived power-ballads. Nearly as captivating as Demon Hunter's music is the ambiguity and mystery surrounding it's members. Constant line-up changes, inconsistent names, and an all-encompassing membership make for outlandish interviews, an ever-evolving live show, and confusing press pictures. Their unorthodox balance of tongue-in-cheek, traditional heavy metal bombast and actual purpose and craftsmanship is as intriguing as it is frustrating for anyone who would try to define the band in concrete terminology. Demon Hunter recorded their debut record for Solid State Records June and July of this year with producer Aaron Sprinkle, and had the luxury of engineering, mixing, and mastering all with respective specialists, yielding one of the most sonically astounding records of the year.